Breast cancer death rates overall have steadily declined since 1989, leading to an increased number of survivors. But while breast cancer survivors are grateful their bodies show no trace of the disease, they still face anxiety. Breast cancer can and does return, sometimes with a vengeance, even after being in remission for several years. By studying the “cannabilistic” tendency of cancer cells, my research team has made some progress in finding out why. The chances of recurrence and disease outcome vary with cancer subtype. About one-third of patients diagnosed with triple negative breast cancer, the most aggressive subtype, may experience a recurrence in another part of the body. This is called distant recurrence. It has been difficult, if not impossible, to predict if and when the same cancer will recur – and to stop it. Recurrent disease may arise from just a single cancer cell that survived the initial treatment and became dormant. The dormancy allowed it to hide somewhere in the body, not growing or causing harm for an unpredictable amount of time. Determining what puts these dormant cells to “sleep” and what provokes them to “wake up” and begin multiplying uncontrollably could lead to important new treatments to prevent a demoralizing secondary cancer diagnosis. Recently, my research team and I uncovered several clues that might explain what triggers these breast cancer cells to go dormant and then “reawaken.” We showed that cell cannibalism is linked to dormancy. How do bone stem cells affect breast cancer? Breast cancer can recur in the breast or in other organs, such as the lungs and bone. Where breast cancer decides to grow depends largely on the microenvironment. This refers to the cells that surround it, including immune cells, cells comprising blood vessels, fibroblasts and the select proteins they produce, among other factors. Over a century ago, a surgeon named Stephen Paget famously compared the organ-specific prevalence of cancer metastasis to seeds and soil. 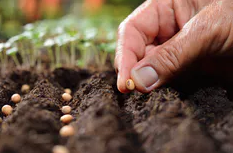 Because breast cancer often relapses in bones, in this metaphor, which still holds forth today, the bone marrow provides a favorable microenvironment (the “soil”) for dormant breast cancer cells (the “seeds”) to thrive. Thus, a substantial amount of recent work has involved trying to determine the role in cancer dormancy of a special type of cell, called mesenchymal stem cells (MSCs). These are found in bone marrow. Just as seeds need soil to provide an environment for growth, cancer cells need an environment to grow. MSCs in bone marrow are highly versatile. They are able to form bone, cartilage and fibrous tissue, as well as cells that support the immune system and formation of blood. They are also known to travel to sites of tissue injury and inflammation, where they aid in healing. Breast cancer cells readily interact with MSCs if they meet in the bone marrow. They also readily interact if the breast cancer cells recruit them to the site of the primary tumor. My research team and I recently focused on potential outcomes of these cellular interactions. We found an odd thing happens, which may provide insight into how these breast cancer cells hide for a long time. In the laboratory setting, we produced breast tumor models containing MSCs. We also re-created the hostile conditions that naturally challenge developing tumors in patients, such as localized nutrient deficits caused by rapid growth of cancer cells and overcrowding. We discovered that cancer cells under this duress become dormant after eating, or “cannibalizing,” the stem cells. Our analysis provided compelling data demonstrating that the cannibalistic breast cancer cells did not form tumours as rapidly as other cancer cells, and sometimes not at all. At the same time, they became highly resistant to chemotherapy and stresses imposed by nutrient deprivation. Dormant cells are widely linked to recurrence. We hypothesize that cannibalism thus is linked to recurrence. What is cellular cannibalism, and why is it important in cancer? Cellular cannibalism, in general, describes a distinct phenomenon in which one cell engulfs and eliminates neighbouring, intact cells. The percentage of cancer cells that show cannibalistic activity is relatively low, but it does appear to increase in more aggressive tumors. There are several reasons breast cancer cells would want to eat other cells, including other cancer cells. It provides them with a way to feed when nutrients are in short supply. It also provides them a way to eliminate the very immune cells that naturally stop cancer growth. Cell cannibalism might also allow cancer cells to inherit new genetic information and, therefore, new and advantageous traits. Notably, in our study, cannibalistic breast cancer cells that ate the stem cells and entered dormancy began to produce an array of specific proteins. Many of these proteins are also secreted by normal cells that have permanently stopped dividing, or senescent cells, and have been collectively termed the senescence-associated secretory phenotype (or SASP). Although cellular senescence is a part of aging, we are now realizing that it is also important for a variety of normal bodily processes, development of embryos and injury repair in adults. This suggests that although dormant cancer cells do not multiply rapidly or form detectable tumors, they are not necessarily sleeping. Instead, at times they might be actively communicating with each other and their microenvironment through the numerous proteins they manufacture. Overall, this might be a clever way for dormant cancer cells to “fly under the radar” and, at the same time, modify their microenvironment, making it more suitable for them to grow in the future. A cancer cell, shown in red, cannibalizes an MSC, which then become part of the cancer cell (as seen in specks in the red cancer cell on bottom left). Can cell cannibalism be exploited for diagnosis and treatment? Although our results are promising, it’s important to be cautious. While there appears to be a strong correlation between cell cannibalism and dormancy, for now we do not know if it is directly linked to cancer recurrence in patients. Studies are underway, however, to corroborate our findings. Still, the fact that breast cancer cells cannibalize MSCs is intriguing. It provides an important foundation for developing new diagnostic tools and therapies. Indeed, we currently have several ways of applying our recent discoveries. One exciting idea is to exploit the cannibalistic activity of cancer cells to feed them suicide genes or other toxic agents, using MSCs as a delivery vehicle, like a tumor-seeking missile. Importantly, MSCs can be easily obtained from the body, expanded to large numbers in the laboratory, and put back into the patient. Indeed, they have already been used safely in clinical trials to treat a variety of diseases due to their ability to aid in tissue repair and regeneration. A different avenue for drug development would involve keeping dormant cells in a harmless and nondividing state forever. It might also be possible to prevent cancer cells from eating the stem cells in the first place. In our study, we were able to block cell cannibalism using a drug that targets a specific protein inside cancer cells. With this treatment approach, the cancer might essentially starve to death or be more easily killed by conventional therapies. Image: Cancer cells, in red, cannibalize a type of stem cell, shown in green. The red cells with small specks of green are breast cancer cells that have “eaten” the stem cell.